Interesting as always, though I am worried by the subscription issue. Casanova419/Vern (and others with similar concerns) - here's a rundown on how things have panned out over the past 4.5 years since TANE Kickstarter was announced. The result of all this effort is that the next release of Trainz will be unlike any previous release. TANE was a release with a brand new engine, while TRS2019 is a release upon an engine that has been hardened and improved over the years. We've added new shaders, lighting and texturing systems on top. Then there's a long list of other under-the-hood technical stuff, plus a bunch of soon-to-be-announced game features. In terms of base game operation, TRS2019 builds upon predominantly the same code base as TANE and has therefore undergone probably 100,000 hours more testing than any other Trainz release to date (and that number is likely to be way too low as we don't measure how long each user plays, only how many install the beta versions). Look forward to the release. I see the Rockey mountaineer from my deck or window most every time it goes by. Should be fun driving it. ... the next release of Trainz will be unlike any previous release. TANE was a release with a brand new engine, while TRS2019 is a release upon an engine that has been hardened and improved over the years. Is this reverting back to the old Jet Engine, or a brand new hardened and improved Jet Engine ? Is there a video of the new game ? I'm quite looking forward to TRS2019 as I was given my first copy of Trainz, 12 years ago next week and can't say I've been disappointed with any of the subsequent releases since. I admit I've been frustrated by Trainz on numerous occasions but that can be said about many things in life and most issues get resolved sooner or later. Good luck. Looking good! My laptop will have to run this on low settings then... I hope I can get a pre-order. Overall this sounds amazing, I'm really excited to see what you've been cooking up since T:ANE. I've got high hopes for this and I'm sure I won't be disappointed in the least. I still can't get over the cab dimensions on that thing. Honestly it looks like one if those Kennecott Copper GP39-2s with the rest of the hood brought up to match it. I also noticed the nose herald on a standard cab unit. RMR doesn't put nose heralds on trail units. The GP40-2s (Not the LWs) only lead trains when a wide cab is out for some reason. That's why they don't spend money on big nose heralds when you won't really get to see them clearly, unlike the LWs. If you also look at some of the photos that logybear shared above, you'll see that the standard cab units lack the snow covers over the blower intake vents behind the cab. Just wanted to get all that off my chest. Call me a rivet counter if you like. 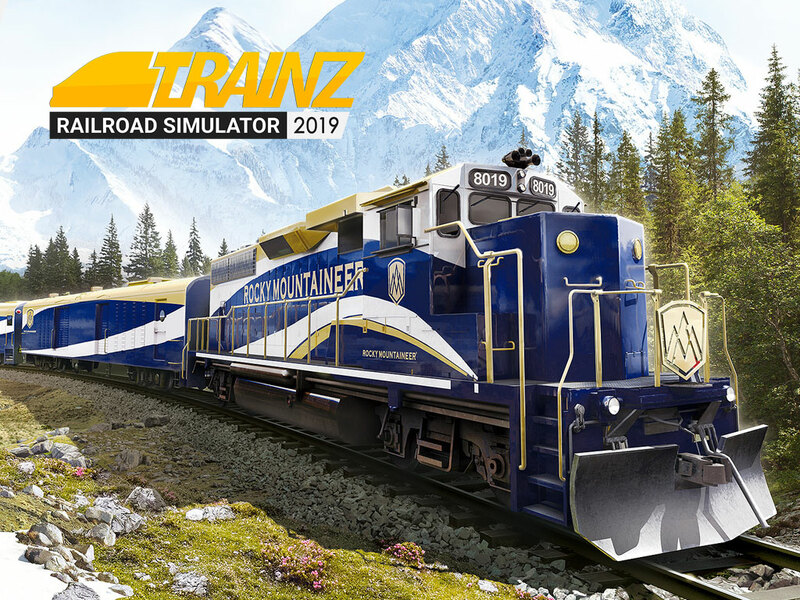 Nonetheless, I'm still very excited to see this next branch of the Trainz franchise. Calling it a GP40-2 is kind. Locos and Cars honestly don't bother me much from stock. The aftermarket is great for that. Its the world around it and hows it put together. From the photo it seems to be a good sized step forward. Be cool to see some changes that happening with surveyor. Ground cover looks much better and not painted on as much. Ground cover looks much better and not painted on as much. Nickrailfan - that is great (constructive) feedback that we can pass on to our artist. Thanks very much. I do notice that our model is of a GP40-2L. I'm not sure how much of a difference that makes (not my area of expertise). Tony, should I ask you if Trainz has built from ground a new sound system and a much more realistic in-game immersion? It would be cool to see actual footage whilst driving, a route with sound from the game. Passing scenes, world editor examples... Well, I can't say that I'm not happy with the editor that comes with Trainz, it's the best thing in the market, step it up guys with some footage because I do wanna go back into this sim, I'm really frustrated with the other payware software available in the market. HaHaHaHaHaHa...... Anyone experienced with N3V and their superior craftsmanship as well as the dreadful T:ANE experience during the Pre-Order to current knows FIRST HAND the answer is a BIG FAT "YES SIR" . Will never ever buy another product from this pathetic software company that hypes things and yet never delivers a quality sound product even after almost 3 years. Still waiting on SP3 for T:ANE while they are working on another version, PATHETIC. Add to that the click oriented community that exists today and N3V having favorites among the 3rd Party Arena, NO THANK YOU. Top off the pathetic in game routes (with DLS Content from others who worked hard yet unrewarded I might add) that were with T:ANE and oh might I add the tiered conflicts, you would be a fool to rush to buy this. Just wait 6 months till they are forced to drop it down 50% or even better 1 year at 75% off cause their revenue is not meeting expectations due to the people's past experiences. Regarding content creation, it's true, we do have favourites. Our favourite content creators are the ones who work together with us to produce great content. Rewards are available on an equal basis for everyone who signs up through our Trainz Content Creation Program (contentcreators.trainzportal.com). I have no idea what you might be referring to outside of that as I have no knowledge of any intentional bias (which it appears that you are implying?). * Win 10 released July 2015, and 5 major releases since then with another due "later this year". * TANE, released May 2015, and 6 major releases since then and another due shortly. I would say that providing updates is part of the service of software companies these days, and we haven't charged for any of those updates. The number and severity of issues being resolved in each update is decreasing, and the stability and functionality improving each update. It;s true that occasionally there is a set back. These setbacks tend to be specific to one area of the program under a very specific set of circumstances. We don't expect everyone to be happy, and we don't expect everyone will jump on board on day 1. What we do expect is that with wider pre-release testing, the myriad of different hardware, content and operational configurations employed by our users will identify any major issues prior to the official release date. Historically we would have released a new version of Trainz prior to now and asked our customers to pay for that update. So rather than ignoring our customers, we're doing everything we possibly can to ensure that when we release the next version of Trainz that we have covered as many bases as possible. I'm not sure what else we could do beyond having over a thousand people test the product and fixing as many of the issues identified as possible. If we charged more, we would have less customers. If we rework every known system and ensure bug free operation before releasing, we will release in 2030 (except that we wouldn't have any cashflow to pay the staff, so that isn't a feasible option). Ultimately, we will do our best. If we do a good job, the product will be well supported. If we don't it won't. And while some will say TANE "didn't work" the numbers speak for themsleves. There are more people playing TANE today than at any time since release 3 years ago. I wonder if won't be tedious to export routes from TS2009 to TRS 2019 once it's released. Not to mention the required specs, looking the graphics will have. Well, looking at that cartoon-ish looking locomotive there, and comparing to what was the locomotive in T:ANE preliminary video, I would say this looks a step backward. If the content is going have the dimensions and looks changed to this style, isn't it kind of like that one on Steam called "Train Fever"? Hopefully at the least in TRS2019 we can lock the post processing settings that offer slightly more realistic graphics. Other than the "somewhere in Canadian Rockies" route, still waiting to hear what the other routes are. Hopefully - verdict on graphics improvements notwithstanding - these will actually be something that can showcase the new sim and not relics from 2006. TRS2019 needs to be going "one on one" with the latest that DTG are offering, both in their heritage product and TSW - if graphics are the main focus of this release.